Joaquin insisted on choosing his clothes for today so I let him. 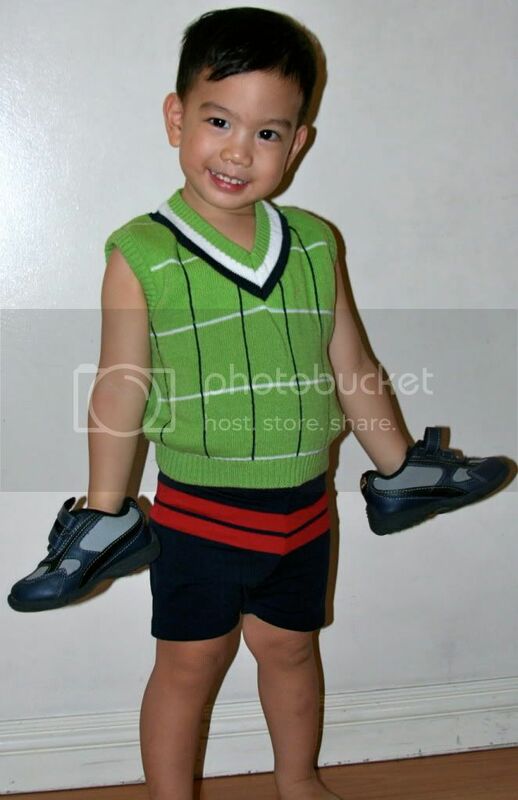 He pulled out a pair of swimshorts and a vest, and wanted to put on his Buzz Lightyear rubbershoes. He seemed so proud of his choice! It was a good thing we weren’t off to a birthday party or church. Most toddlers at around 2 years of age will enter the stage of “I can do it myself!” He will insist on feeding himself, bathing himself, dressing himself and doing every little and big chore in between. If it’s not dangerous and not costly, encourage your little one do things on his own. These are good signs that your child is developing normally. that’s cute ate jenn. buti you’re not going to a wedding or something formal. haha. joaquin is the cutest!! Bakit Jenn, mukha namang pang Buzz Lightyear ang vest nya a. Hahaha. Joaquin has really grown so much. And thanks for this post. I’m sure a lot of moms can relate. Ohhhh….so cute…he is soooooo handsome for sure! You sure do make the cutest babes.